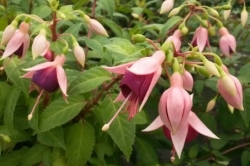 The fuchsias listed in this section have a lax growth habit, which makes them particularly good for hanging baskets, or for cascading down the sides of patio pots. These varieties will require protection from frost during the winter, but provide an abundance of amazing colour during the summer months. Tube and sepals pale pink with green tips, corolla soft violet with streaks. Wide spreading flower, tube and sepals carmine, corolla orange-red, will give the best colour in a shaded position. Very large flower, tube and sepals a whitish pink, corolla mauve edged with magenta. Free flowering, tube white, sepals indian orange, corolla magenta, colours best when in some sun. A superb variety for basket work, with the majority of the flowers produced at the tips. Tube and sepals white flushed with carmine, corolla rose bengal. Medium sized flower in mid-season, tube and sepals red, corolla lavender blue with pink at the base, requires shade. Free flowering easy to grow variety, tube and sepals pale salmon, corolla rich orange. Vigorous variety, tube and sepals orange, corolla orange carmine. A handsome variety wth generous flowers. Tube and sepals white, corolla deep purple. Long pale pink tube and sepals, deep purple corolla.